Israel moved Sunday to deport the offspring of hundreds of migrant workers, mostly small children who were born in Israel, speak Hebrew and have never seen their parents’ native countries. Prime Minister Benjamin Netanyahu said the new policy was intended to stem a flood of illegal immigrants, whose children receive state-funded education and healthcare benefits, and to defend Israel’s Jewish identity. In many ways, this story is reminiscent of the immigration policy debate here in the US. (I encourage you to learn about and support “The Dream Act” which has been considered by Congress in one form or another since 2001 but shamefully, has yet to be signed into law). Still, there are important differences between the American and the Israeli situations. Perhaps most critically, although Netanyahu cites concern over illegal immigration, Israel is moving to deport children of immigrants who entered the country legally. 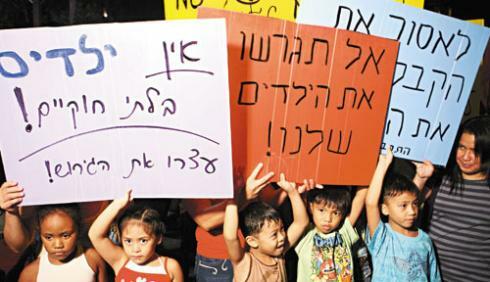 As the article points out, Israel began allowing Chinese, Thai, Filipino and other workers into the country in the 1990’s to replace Palestinians as a source of cheap labor in the wake of the First and Second Intifadas. Today there are 250,000 to 400,000 foreign workers in Israel – but now that they have (quite naturally) begun having families of their own, Israel is growing increasingly concerned over the “demographic makeup” of the Jewish state. To be sure, every nation has the right/responsibility to regulate its own residency and citizenship laws. Nonetheless, the criteria it uses to maintain these regulations is crucial. And this raises another important difference between the American and Israeli immigration policy debates. Here in America, no one but the most abject racist would openly suggest it is appropriate to cite the religious/ethnic identity of immigrants when considering their children’s legal status. In this regard, Netanyahu’s comment – framing it as a choice between humanitarianism and Zionism – in profoundly telling. Is this indeed Israel’s ultimate choice? And if so, which will it ultimately choose? It’s the deportation of children that threatens Israel’s Jewish character. The obligation to act with kindness and compassion to foreigners is the most frequently repeated commandment in the Torah. This entry was posted in Children's Rights, Immigration, Israel, Zionism on August 2, 2010 by Rabbi Brant Rosen. Thank you Brant for this clear and courageous piece. Often when we, as Jewish Americans, protest discrimination against immigrants in the U.S. we ignore the immoral policy of the Israeli government. Thank you for pointing out that the immigrants in Israel are legal and there is no hesitation in citing ethnic considerations as the reason for their deportation. I hope your article sparks some conversation on this important issue in the Jewish community. BUT: Will Israel continue to be a Jewish state? Just catching up, Brant, on your blog from the last few weeks and months. Evidently the price of Jewish statehood is the ongoing exile of somebody else: first the hundreds of thousands who fled or were expelled in ’48, and who must never–nor their descendants, ever–be allowed to return, and now these children. It all begins to remind me a bit of that Ursula K. LeGuin story I read as a boy, with Israel as Omelas.